Providence Canyon is located north of Providence. 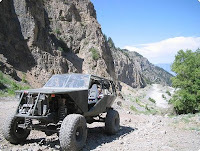 The canyon starts to get interesting at the quarry and eventually takes you to Logan peak at the highest point and intersects with many other canyons including Millville and Logan. Many times we have taken tents in the summer time to enjoy a few days in the cool temperatures in the higher elevations. The road is a popular snowmobile route in the winter. Providence cave is a short hike from where we sometimes like to camp and we have recently found some other caves near the top of Blacksmith fork canyon as can be seen in our July, 2007 Trip report. The map below gives a rough idea of the trail that is currently open. 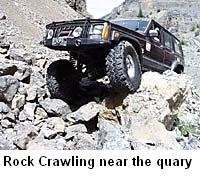 Above the quary, the road requires a capable 4x4 and good off road driving skills. 4x4's without lockers will struggle, but will make it with enough clearance and low tire pressure. The main attraction is the quary itself and the road from the quary to the top of the canyon, designated by orange on the map. 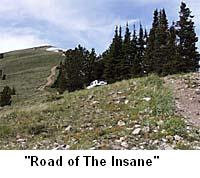 A closed portion sometimes referred to as "the road of the insane" was a rocky ride along the ridge up to Logan peak and real joy to climb! It's sad to see it go, and for no apparent reason. We always referred to it as "the backside" or the backside of logan peak because it is a secondary route to Logan Peak that travels up the back side. It is a much faster and more direct route to the peak. Providence cave is a somewhat small cave that from it's initial appearance is no more than a large hole in the ground. It's worth the hike though, and worth checking out. To get there travel roughly the route marked on the map by the icons. Starting from the camp area, hike North out to the first ridge and turn West to go along this ridge. As the trail starts to become less obvious, the cave will be located just off the ridge to the left. The picture to the left is the entrance to the cave. It can be hard to find, follow the trail and if you find you can't follow the trail as well, walk about 20 yards North down the hill. (marked by the arrow on the map below) It's usually muddy and slippery in the cave so take caution and make sure to take flashlights along with you. 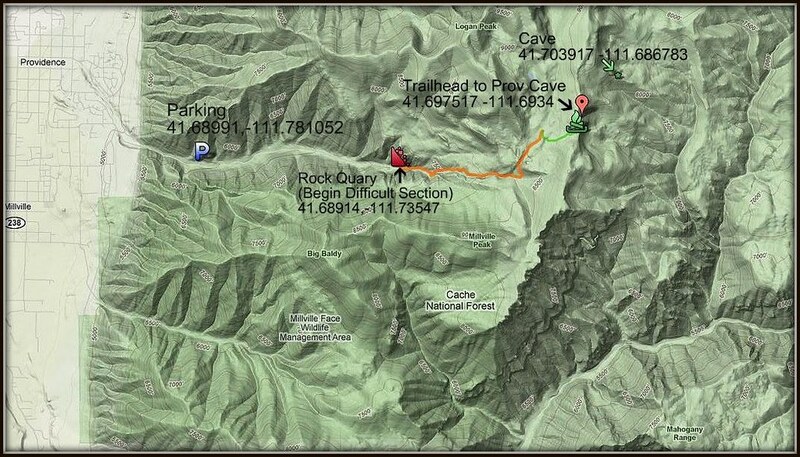 The GPS Coordinates of the cave are 41*42.235N 111*41.207W and 8,527ft . The location of the trail head is 41*41.851N 111*41.604W and 8,739ft. Click "Directions" for directions from your location to the quary where the fun begins! If your hauling a trailer and/or have a need for parking before you head up the canyon, there is a large area to park designated by the "P" on the map. I have taken my dirt bike up the canyon a number of times, it's a beast on a bike because of the large quantity of loose rocks, but if you think you're up for the challenge, it can be fun. View TRIP REPORTS For Providence Canyon.